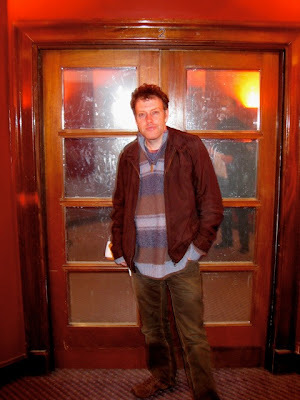 My recent encounter with American filmmaker Craig Baldwin has now been entered into the Resonance FM schedules. As with previous interviews, it will initially go out in two parts over consecutive episodes of Imreadyformycloseup – on April 16 and 23 respectively at 5 pm. This will be followed by a one-hour IRMFCU special of the entire conversation on May 7 at 8.00 pm. Craig talks animatedly about ‘repurposed’ cinema, trash aesthetics, Ed Wood and the California mindset with some fascinating excursions into the thinking not only behind some of his earlier flicks such as Tribulation 99 and Spectres of the Spectrum, but his recent left-handed blockbuster Mock Up On Mu. The May issue of The Wire also will feature my account of the conversation, inspired by the magical sounds of Korla Pandit – his spirit continues to watch over us all. 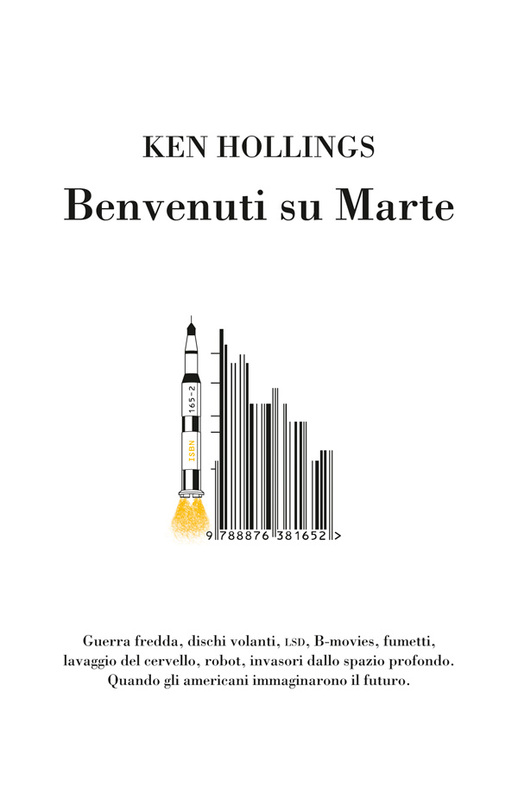 The Italian edition of Welcome To Mars is due to be published by isbn edizioni at the end of this month; and I have to say that I am delighted with the cover design they’ve chosen for Benvenuti su Marte. 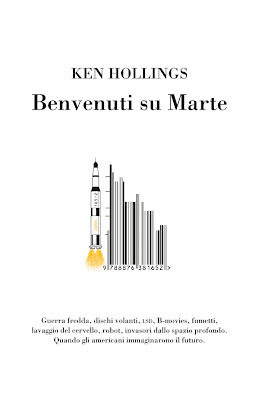 The book has already started to attract some good attention, being the subject of major features in La Stampa and Il Venerdi plus a respectful mention in the Italian Wired, which I guess must be like getting into Italian Vogue – chicer and stranger than the US original but you’re not quite sure why. Respectful greetings to all my future Italian readers. Modelled on the one Henry David Thoreau built at Walden by way of Stewart Brandt’s Whole Earth Catalogue, the cabin Ted Kaczynski built for himself in the woods outside Lincoln Montana had neither electricity or running water. It was from this location that he launched his deadly ‘Unabomber’ campaign and also where he composed his manifesto Industrial Society And its Future. Following his arrest in 1996, the cabin was impounded by the FBI as evidence and moved from its original site. This paper version was sent to me Felix, a contact in Barcelona. 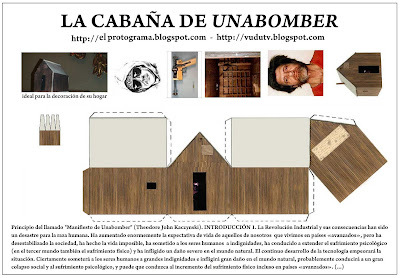 The fact that it’s a jpeg of a handicraft ‘kit’ version of a handmade structure distributed online suggests that the true architecture of the Unabomber Cabin is as much conceptual and temporal as it is spatial. It’s been a while since I posted anything in the ‘Catching Up With...’ series; but I am planning some additions to it over the Easter period. It takes a very long time for a building to give up all of its meanings. Earlier this week I spent a highly diverting couple of hours with American underground filmmaker Craig Baldwin at the Resonance FM studios, recording a special edition of Imreadyformycloseup, which should be going out in the next two or three weeks. Craig was just passing through London on his way from the Newcastle AV festival to attend a couple of screenings in New York before returning to his lair at the Artists’ Television Access in San Francisco. 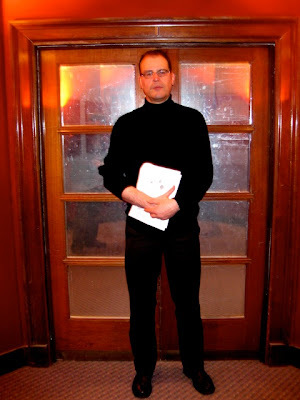 We spent a lot of time talking about his latest film release Mock Up On Mu and its relationship to some of his previous work such as Tribulation 99 and Spectres of the Spectrum. The musical spirit of Korla Pandit watched benignly over us and a silver moon shone down from somewhere behind a clear blue sky. It was a real pleasure to discuss Craig’s work with him in such relaxed detail and I hope the final show reflects that. Broadcast details will be flagged up on this blog as and when they become available. Pictured above from top to bottom: Craig Baldwin, series producer Richard Thomas and KH at the start of the recording; Craig Baldwin and KH get talking while session engineer Mark Robins looks on; Craig Baldwin in full effect; Craig Baldwin and KH try to be serious for a moment. 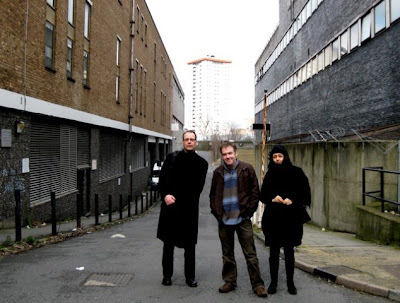 I recently went with Mark Pilkington of Strange Attractor, Andy Sharp of English Heretic, and Leila Dear of electronic beat combo Indigo Octagon on a visit to the Crash exhibition – ‘homage to JG Ballard’ – at the Gagosian Gallery in Britannia Street WC1X. A pale sun beat feebly down on bare winter branches. A bobbing Mickey Mouse balloon leered at us from a nearby Starbucks window. Kings Cross had never seemed lovelier. From time to time, usually when we least expected it, Mark would pull out his camera. Pictured above from top to bottom: KH, Andy Sharp and Leila Dear preparing themselves for another spring in the Northern Hemisphere; turned on by the smell of damp underlay and dusty light fittings, KH and Andy Sharp mistake Mike Nelson’s ‘Preface to the 2004 Edition (Triple Bluff Canyon)’ for an orgone accumulator and start vibrating in unison with some of the images embedded in the old movie-house fixtures used as part of the installation. Leila later observed that the arrangement of the walls in this ‘constructed space’ was, in fact, octagonal. Photographs by Mark Pilkington - who also came up with the title for this post. As far back as 1950 the mathematician Alan Turing predicted that ‘at the end of the century the use of words and general educated opinion will have to be altered so much that one will be able to speak of machines thinking without expecting to be contradicted’. Today technicians at MIT are teaching a robot dog how to read a child’s picture book. Movement and image recognition both suggest new ways of looking at how machine intelligence – and by implication human intelligence – operates. But what actually happens to machines when they start to think for themselves? What will constitute an identity for them? What will their gender be? How we will interact creatively with them? More importantly, what will they have to teach us about our own creative thinking? Prepare for the singularity and the coming of the third culture by visiting John Brockman’s Edge site. To talk with Eliza, click here. To talk with ALICE, click here. Or to talk with Captain Kirk (no really), click here. YouTube clips embedded above: the new Rock ‘em, Sock ‘em Robots (some self-assembly required); Carl Rogers and Gloria Counselling Part One: Eliza, an early conversational programme for computers was modelled on Carl Rogers’ ‘Person Centred’ approach to counselling. Click here to follow the entire series of encounters online. 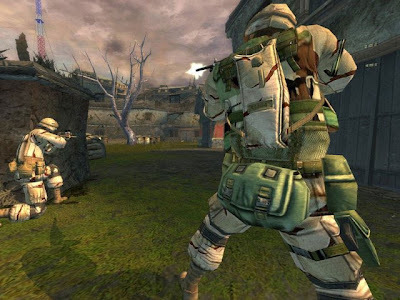 A sound file of my recent Radio 3 feature on the military-entertainment complex, ‘From Gameboy to Armageddon’ has just been posted by those noble souls at Speechification. You can access it by clicking here. The Speechification site is turning into an amazing archive – and as such represents both the end of spoken-word broadcasting as we have known it and its continuance as well. Thanks for listening. Pictured above: Full Spectrum Warrior – getting up close and personal with modern warfare. I am very pleased to announce that a revised and expanded version of my essay ‘The Future is Back’, on reading McLuhan in the digital regime, is now available courtesy of the Spring 2010 edition of Otherzine. You can go directly to the piece by clicking here. Also included in issue 18, however, are a couple of great interviews which you may want to check out – Craig Baldwin talking with Bob Dobbs about media ecology and Jack Stevenson interviewing Mike Kuchar on his 1965 underground classic ‘Sins of the Fleshapoids’ – plus an analysis of Antonin Artaud’s film theory from J M Magrini. 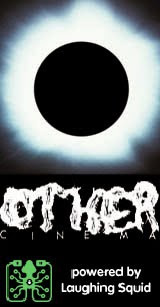 Otherzine is put together by the fine, fine people at the Other Cinema in San Francisco; and it’s always a pleasure to find a piece of my work in such good company – my thanks to everyone involved. Pictured above: the Other Cinema star shines darkly. Trash has traditionally been seen as the unnecessary by-product of progress: the further we advance, the more trash we generate. Green strategies in design, together with the use of recycled materials have become commonplace in recent years. But what about the discarded trash of our popular culture? Not only are old images, themes and footage recycled in communication design but an entire trash aesthetics has come into being – classic ‘kustom kar’ pinstriping, tattoo ‘flash art’, tiki art, musical exotica, pulp fiction, burlesque bump and grind and Z-grade movies have all provided a refuge for designers tired of the banalities of a mainstream culture increasingly run by multinational media corporations. When large banking concerns like HSBC start boasting that ‘understanding culture is our business’, how completely do you now want to be misunderstood? Run (don’t walk) to the nearest exit. 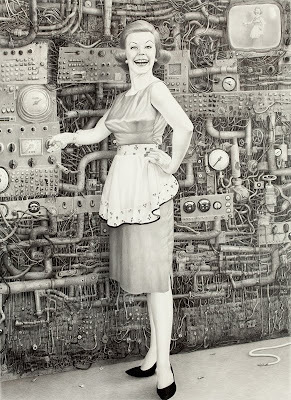 One of my favourite artists, Laurie Lipton has a rare feel for the rarefied sensory deprivation of the suburban experience: the scuttling and crawling that informs the astringent moral vision of her pictures (and I constantly maintain that it is, above all else, a moral vision) is given form and substance by the glossy banality of their setting. The two drawings reproduced at the top of this post, ‘On’ and ‘Off’ are indeed terrible to behold – in some ways reminiscent of a faked photograph going the rounds allegedly showing a gigantic RAND computer from 1957 but actually photo-shopped from a nuclear submarine’s control room on display in the Smithsonian. 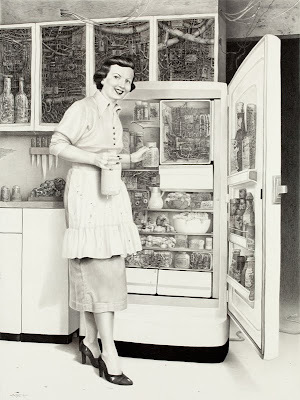 However, the true terror of Lipton’s vision is to be found in the delicate folds and frills of the housewives’ aprons – the spirit of ‘Momism’ has never been more accurately depicted. 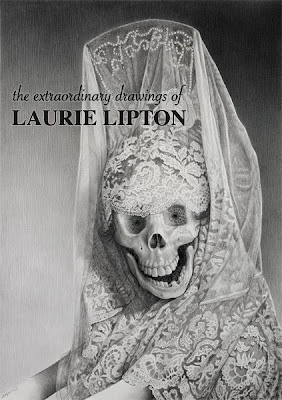 Now you know why no one ever checks into the Bates Motel since the early 1960s – and why Laurie Lipton is always such a welcome visitor to this blog. Now buy it or die. While teaching at Black Mountain College, a home from home for European modernist art and design in 1940s America, the composer John Cage caused uproar by suggesting that musical compositions should be organized according to principles of duration rather than harmony. Music, in his view, was now a multimedia practice. Anything could now be part of a performance. The development of Cage’s graphic scores as maps of events eventually questioned the role of text itself: they also represented a confluence of modernist thinking on performance that embraced Futurism, the Bauhaus, Le Corbusier’s theories on architecture and Varese’s speculations on the relationship between the creative process and twentieth-century technology. As music and image processing software increasingly permits us to manipulate sound and vision as plastic entities, the relationship between the graphic score and the data stream is due for serious reassessment.